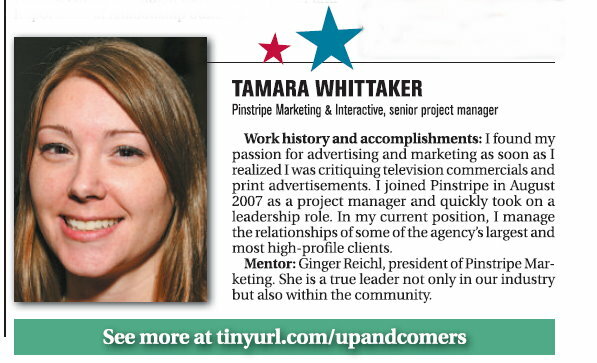 Pinstripe Marketing is pleased to announce that Tamara Whittaker was recently selected to the Tampa Bay Business Journal 2010 Up & Comers. The Up & Comers list recognizes young professionals who have made significant contributions to their businesses, industries and communities. Whittaker is a senior project manager at Pinstripe Marketing, a full-service communications agency that specializes in promoting professional services firms. 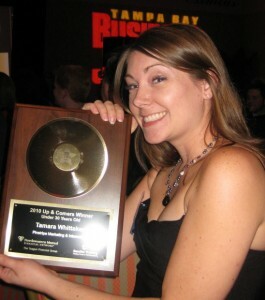 She is also president of Ad 2 Tampa Bay, a division of the American Advertising Federation for professionals 32 and younger. Pinstripe Marketing is a full-service marketing agency specializing in promoting services firms. Services include strategic planning and implementation, marketing communications, advertising, event planning, media buying, web design and public relations. For more information, please visit www.pinstripemarketing.com.